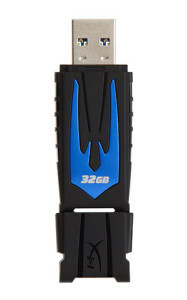 USB Flash drives are getting cheaper, and their capacities are rising rapidly. But with larger capacities, another important factor is beginning to emerge – the speed data can be transferred on and off the device. Kingston’s HyperX range of DRAM memory modules is acclaimed among the speed-seeking games community. The company has now launched a range of USB Flash drives under the same brand name. But what’s in a name? My first hard drive, a Shugart ST-506 installed back in the very early 1980s, was 5 MB in size. Yes, that’s megabytes. Floppy disks, previously my sole storage resource, were measured in kilobytes – a couple of hundred of those at the most. USB Flash drives also started small, appearing on the market in late 2000 with a capacity of 8MB. The data transfer rate of those first USB devices was a mere 12 Mb/s. I’m trotting out this history lesson to explain why an old codger like me finds the 64GB HyperX Fury USB drive so genuinely (to put a wildly overworked word to its proper use) “awesome”. This thumb-sized device can contain nearly 13,000 times the capacity of my first 5-¼ inch hard drive, and instead of having to spend an entire afternoon programming the BIOS in hex to make it work (as I did with the Shugart) I simply plug it into a USB port on my MacBook Air or Linux or Windows desktop machine. And thanks to the latest USB 3 specs the data now moves across that interface up to 60 times faster. I say “up to” because flash drives have different speeds for reading and writing: reading is generally much faster. And while we’re on the subject, look out for those quoted units. Link transfer speeds are normally measured in megabits per second (Mb/s), but data rates will typically be quoted as megabytes per second (MB/s). With eight bits to a byte, and allowing for extra bits used in the transfer for control purposes, this normally translates to an order of magnitude difference between the two units. On a rather less technical note, one of the major annoyances with USB Flash drives is the removable, and therefore losable, drive cap. I prefer the kind with an integrated connection cover, usually achieved with a slide or a swivel. Second-best is the removable cap that can be clipped onto the non-business end of the device when it’s plugged in. The HyperX Fury takes this approach, but the clip is somewhat feeble, and the cap could easily get lost. The Kingston USB drive arrives factory formatted as FAT32, but with 64GB to play with this may not be the most useful filesystem. FAT32 limits file size to 4GB: if you’re likely to be dealing with big files (if you’re recording HD streams, for example) you might want to reformat the drive to XFAT. The XFAT allows for practically limitlessly large files without the additional overhead of a more complex filesystem like NTFS, and can be read and written on all modern operating systems (Linux may need special drivers). Be aware though, that XFAT is especially encumbered by Microsoft licensing restrictions, and may not therefore always be appropriate for your use. Alongside the megabytes/megabits snare, Kingston’s product styling and branding is another potential source of confusion. There are two different versions of the “HyperX” brand in the USB drive range: the “Fury” and the “Datatraveler.” From the names you might expect the Fury to be racier and chunkier, with the Datatraveler catering for the more sedate business market. Actually it’s the other way round. HyperX Datatravelers range from 64GB up to a huge 256GB, and push the USB 3.0 bus speeds closer to the max, reading and writing at 225MB/s and 135MB/s respectively. The Fury range, despite its racy name and styling is more modestly specced, with USB 3.0 read/write speeds of 90MB/s and 30MB/s. Speed and capacity come at a price, and it seems Kingston thinks only the “put it on expenses” business market can afford the best that USB Flash has to offer, leaving games players (who will be paying out of their own pockets) with much more modest technology, albeit dressed up in go-faster stripes and marketed under an aggressively racy name. My advice: ignore the branding and the styling and just look at what you’re getting for your money. The Fury drive reviewed here gives you a very decently performing 64GB for around 25 quid. If you must have the very fastest and biggest USB flash drive, look for the Datatraveler range and be prepared to pay nearly twice the price.